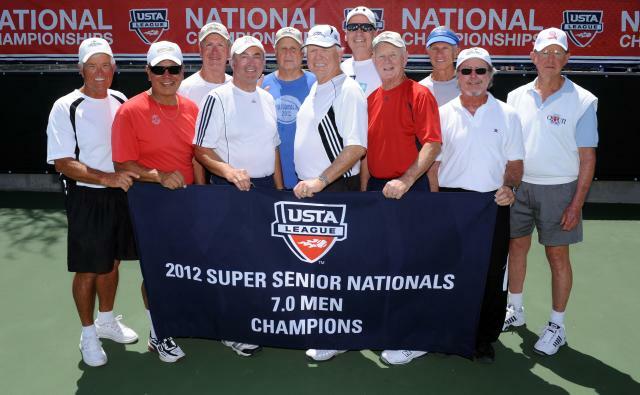 SURPRISE, Ariz., – The men’s team from Sun Lakes, Ariz., representing the USTA Southwest Section, captured the national title at the USTA League 7.0 Super Senior National Championships held at the Surprise Tennis and Racquet Complex in Surprise, Arizona. The Sun Lakes team defeated a team from Atlanta, Ga. 2-1 in the Championship match, capping a perfect 5-0 run at the national championships that also saw them defeat teams from Puerto Rico, Hawaii, Northern California, and Virginia. The team, which played out of Iron Oaks Tennis Club, is captained by Ken Stanley and features Bob Walk, Bill Corso, Marv Jensen, Jerry Rex, Maurice Allen, Bill Hughes, Jim Utter, Terry Logan, Art Baessler, Greg Mather and Gary Porter. The team plays at Iron Oaks Tennis Center and finished with a 18-0 record during their entire season that included local USTA Central Arizona league play and the Southwest Section Championships as well as their five matches in Surprise. The top four teams in order of finish at the League National Championships Men's 7.0 division were: USTA Southwest (Sun Lakes, Ariz.), USTA Southern (Atlanta, Ga.), USTA Missouri Valley (Topeka, Kan.) and USTA Caribbean (San Juan, P.R.). The run didn't stop there for teams from the Southwest, as a 7.0 Super Senior women's squad from Tucson finished third. Captain Patricia Wagner and her team from Himmel Park captured their flight with wins over teams from New Jersey, California and Nevada before falling 2-1 to a squad from Oahu. The Tucson ladies then rebounded in the third place match with a 2-1 team victory over a squad from Virginia Beach. 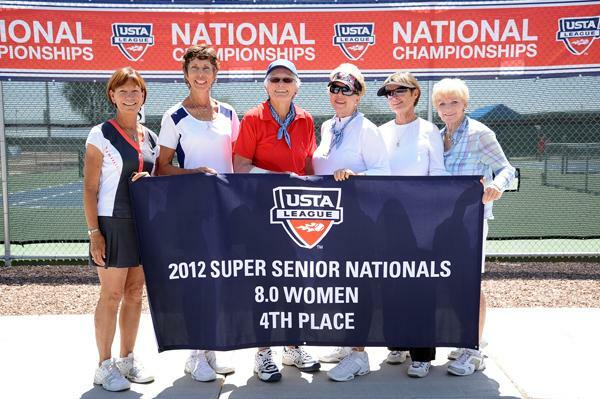 A week earlier at the 6.0 and 8.0 National Championship event in Surprise, a women's 8.0 USTA Southwest team from Central Arizona (captain Marsha Speck) playing out of Scottsdale's Indian School Park, finished in fourth place. The team consisted of Linda Renner, Mary Garbaciak, Susie Murphy, Joyce Sabol, Ann Alpeter, Nancy Theilman, Mary Ann Mitcham and Speck. The Central Arizona team was the defending champion coming into this year's event. The squad won their flight by downing teams from Florida, Intermountain and New England before falling to Southern California in the semifinals and Southern in the third place match. We want to extend congratulations to our teams on their great performances! 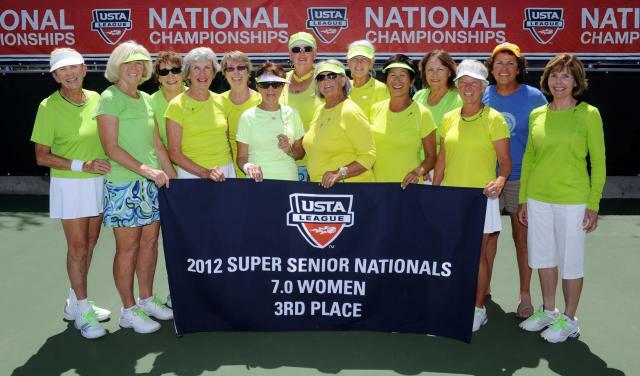 This marks the fifth consecutive year and sixth title that a USTA Southwest team has won overall at the USTA League National Championship in the Super Senior Division since 2008. We are most definitely the Super Senior kings and queens! NOTE: With the league restructure occuring this year, it is important that our players request leagues of 65+ years old in their local districts - so we can continue to have age appropriate competition as much as possible. Contact your local league coordinator for more information! 2011 - CAZ 8.0 women (captain Marsha Speck - Indian School Park - Scottsdale, Ariz.
ABOUT USTA LEAGUE TENNIS: Since its inception in 1980, USTA League has grown from 13,000 participants in its first year, to over 820,000 players across the nation today, making it the world’s largest recreational tennis league. 2013 LEAGUE RESTRUCTURE: Beginning with the 2013 National Championship season, USTA League changed its structure and format. The change offers USTA League participants among three age categories (Adult 18 & Over, Adult 40 & Over and Adult 55 & Over and Mixed 18 & Over) to better align participants with players their own age. The restructuring guarantees more frequency of play opportunities at more appropriate age groups. Head Penn Racquet Sports is in its 26th year as official ball of USTA League. The USTA is the national governing body for the sport of tennis in the United States and the leader in promoting and developing the growth of tennis at every level, from local communities to the highest level of the professional game. A not-for-profit organization with more than 770,000 members, it invests 100 percent of its proceeds in growing the game. It owns and operates the US Open, the highest-attended annual sporting event in the world, and launched the Emirates Airline US Open Series, linking nine summer tournaments to the US Open. In addition, it owns approximately 90 Pro Circuit events throughout the U.S. and selects the teams for the Davis Cup, Fed Cup, Olympic and Paralympic Games. The USTA’s national charitable foundation, USTA Serves, provides grants and scholarships and helps underserved youth and people with disabilities. For more information on the USTA, log on to usta.com, "like" the official Facebook page, facebook.com/usta, or follow @usta on Twitter. To follow USTA Southwest, visit us at southwest.usta.com or on Facebook, Twiiter, or Instagram.